How to Extract Movie Audio? How many times have you watched a movie with a fantastic piece of music on it? Wouldn’t it be great if you could make it an MP3 file to play on your computer or music player? As long as you don’t infringe on copyrighted material, there’s a great selection of audio extraction tools that you can use to generate digital audio files from video. In this tutorial, we use our excellent program – Free Video Converter to show you how easy it is to make your own MP3s from a movie. 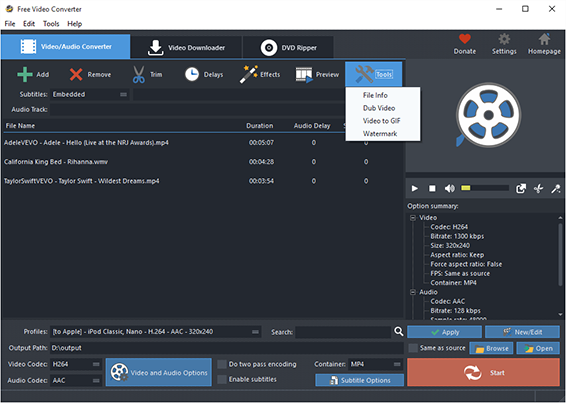 Click “Add” to import HD video files – to import one or more files, choose “Add Files”; to import a folder with video files, choose “Add Folder”; to import a folder with subfolder(s), choose “Add Folder Tree”. The you can use “Up” & “Down” to change the order. In “Profiles” menu, select the device you want to play the video on and you can see the details of the profile you select in the “Option Summary” panel at the right. If you know exactly the format your device supports, you can directly choose the output format in “Container” menu. To edit the parameters of the profiles, click “New/Edit” and change the settings in the “Profile Editor” Window. You are allowed to choose the video and audio codec as well as the encoder to use. To change the codec settings, click “Video and Audio Options” and set the options as you want. When all settings done, click “Start” to start audio extraction. When the extraction is complete, click “Open” to find the extracted audio files in the output folder. To download videos from 300+ video sharing wesites, click “Video Downloader” tab. You are also allowed to trim the video by “Trim” and to apply effects and add delays, click “Effects” and “Delays”. It also allows you to rip DVD-Video. 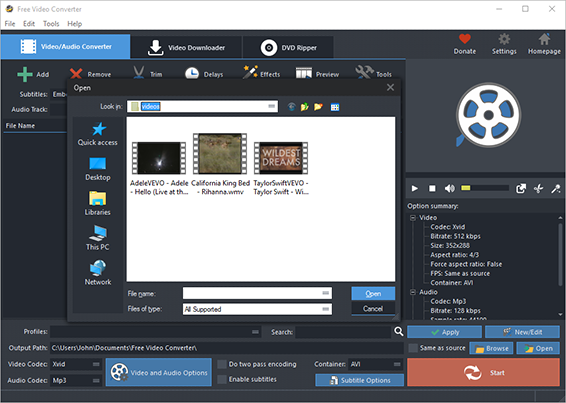 Just insert you video DVD or Blu-ray disc and click “DVD Ripper” tab to use the ripper. Click “Tools” button and you will find more functions that may come helpful: File Info, Dub Video, Video to GIF and Watermark. How to Convert HD Videos for iPad Playback?